Cuba is sometimes playfully referred to as a the sleeping crocodile, if you look at it’s shape on the map that’s what it looks like. When I arrived in Cuba it was raining – and the airport staff were hard to distinguish properly because some of them were formally dressed whilst others were in their own clothes – in some cases the tightest brightest and outlandish mini skirts with fishnet tights with very high heels – it was a colourful array. I immediately got the sense that I was amongst people who don’t take appearances too seriously – they dress however they feel comfortable and hold their heads up high doing it – and so they should! “Two weeks before any woman is due to give birth she can stay in lodgings that offer her a room and board to care for her until the baby is born – to avoid the risk of being isolated somewhere when going into labour”. “The Cuban government encourages women to have children before they reach 30 years old”. Another cuban guide told us that people don’t really bother getting married much in Cuba, they just live together and tend to have just one child nowadays as it’s too expensive to have any more. “Family doctors receive a purpose built home from the government – these homes operate as a GP practice on the ground floor, with two more floors above, one for the doctor and his family and one for the nurse and her family and there is a family doctor allocated to every ‘so many’ people across the country so that services are evenly spread”. What a lovely and logical arrangement, not to mention generous – if this was the case in the UK we might see a reverse in the decline of nursing degree applications. Mosquito control isn’t just for the tourist areas…. “During the rainy season it is compulsory for every home to be fumigated by fumigators sent by the government. The service is free and two attempts will be made – if you are going to be out you should ask a neighbour to let them in for you as a fine is issued if the fumigators fail to access your home”. “It is important to fumigate all homes in this way to manage mosquito lava levels (rather than simply killing the living insect)”. “Wages earned by Cubans are a world apart from the reality of the cost of living – not surprisingly then, the black underground economy is a necessity for many in order to scrape a second income”. Prior to visiting Cuba a colleague had shown me an interesting article about Cuban doctors working as taxi drivers after their medical shifts to make some extra money as it pays more. It sounds crazy when you think of the difference in education level, skill, knowledge and training needed and level of responsibility held for each of these jobs but it seems that’s how it is. Taxi drivers earn more than doctors! “Most university educated people go looking for jobs in tourism because it pays more than being a doctor – sadly. Our Virgin Cuban Experience tour driver was an engineer by trade, but earning more as a driver”. Apparently there is no credit in cuba, you cannot get a mortgage to buy a house, but there are no homeless people in Cuba because the government makes sure every citizen has somewhere to live. “Most of the tourist buses and rented cars come directly from the Chinese and Russia – with a trail of Cuban debt to China and Russia behind it”. Something that struck me was just how visible a lot of cuban labour is – to anyone looking. When driving around the island you will no doubt see countless fields and expanses of land where people are grafting hard, sowing seeds, ploughing the field with yolked cattle, swiping down tall crops with a blade – and more often not, the men are kitted out with cowboy hats as they toil – I guess all this activity has something to do with why the older men still looked young, fit and strong. Santeria is one of the Cuban religions that derived from slaves who had catholicism forced upon them; slaves used elements of the catholic faith an mixed it into a spiritually modified version, a unique faith. Homes may have a room or area dedicated to the worship of the chosen saint. People pick their favourite saint and dress all in white as part of their Santeria initiation process into a symbolically ‘new life’, out with the old after a period of symbolic purification – part of this process involves a range of ritual behaviours and prohibitions, like not being allowed to get wet in the rain amongst other things. You will see quite a lot of women dressed all in white across different parts of Cuba – I’m guessing this was the reason. I’m not sure if men go through the same initiation, dressing all in white…. Apparently, Jehovah’s Witnesses are the most rejected religion in Cuba and issue is taken with the fact that they will not sing the cuban national anthem or salute the flag. Our Virgin tour guide ( native cuban) for the Cuban Experience tour told us that cuban water is safe to boil and drink – he compared it to water in Africa, where he said the water has more germs apparently (not sure if this is true of the entire continent of Africa, with different degrees of water hygiene depending on where you are – a bit of a sweeping statement perhaps…anyway). One of the cuban restaurants we ate in (in Trinidad) had no running water to wash your hands after using the toilet – instead there was a plastic bowl of dirty water placed in the sink and some soap. We were also informed that Cuba doesn’t have any starving people like they do in Africa!! 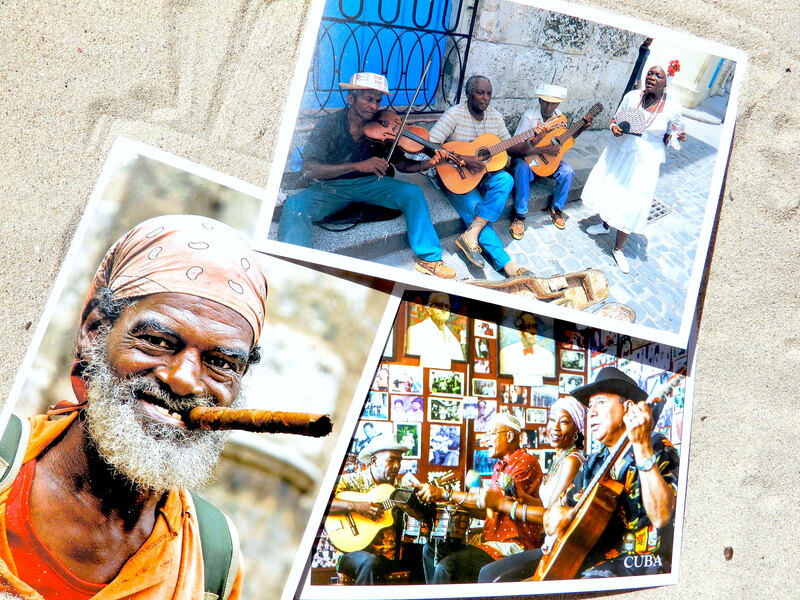 Although Cuba is naturally a melting pot of mixed races, you tend to find more interracial mixing in the east of the island, whilst in Havana “anything goes” according our tour guide. It was interesting to hear that the ethnic bloodlines and DNA of cubans is not always what it appears to be – i.e. some very dark skinned people have more european physical features and DNA (including blonde hair in some cases) than those who appear to be ethnically white and vice versa – white caucasian appearance with very african physical features is also common. There are also many white individuals with european features (as you’d expect) but they carry more african DNA in their blood. The moral being – you really can’t judge a person’s race or bloodline just by their skin tone or facial features. Our guide also pointed out that the majority of the cuban population are lower middle class – this surprised me, given the large amount of poverty that seems to persist. In Cuba it’s not how much money you have but ‘who you know’ that can get you the things you want. It’s interesting that over a three week period the common question that Cubans would ask me (from hotel staff to locals in the street), was “are you American”? Well the national bird is the tocororo, and all the guides will tell you more. I want to tell you about something that felt a bit like a scene straight out of Hitchcock’s “The Birds”. Never in my life have I witnessed or heard such a racket from birds in a busy city area (or anywhere for that matter). In the centre of Havana, right across from the Parque Central Hotel there was a tree lined walkway – a section of those trees had branches crammed with little black birds that were making the most loud and almighty high pitched screeching (not chirping), it was a very strange and eerie sound. The clips don’t really convey just how screechy and creepy it was. There also seemed to be lots of large black birds of prey flying above us through the tour whilst on the road in particular – flying low, circling areas below. Turns out that these are vultures, and you’ll see them a lot. You know when you’re out on a touristy excursion/trip and there’s always the odd dog following the group of tourists around…well in Cuba, (and other countries) if you pay attention you will spot a pattern. The dogs only seem to follow foreigners! In Cuba they never follow the group when the group are cuban. Our guide reckons it’s because foreigners might smell different, whilst someone else in the group asserted that it’s more to do with sounds and language – the dogs are curious when they hear an unfamiliar tongue…..well you learn something new every day!! Bring lots of pens to Cuba. Locals will ask you for them – just like that. One of many examples was after a stream train trip, I asked the train driver if I could take a photo with him – we did this and then he asked me if I had a pen. I thought he wanted to borrow the pen or write something down for me, but instead he took the pen and off he went. Pens are in demand – if I’d known, I’d have brought more. Just an observation – whilst in Cuba I noticed a lot of German and Russian tourists (which is great, I’m not being negative), it’s positive to see strong representation from other parts of the world coming to visit the island. I didn’t sense as many fellow Brits, but perhaps they were just being a bit quiet lol. Each day the Nine Canyon Ceremony at La Cabana Fortress takes place at 9pm sharp – so sharp that locals set their watches by the blast for miles around. The José Martí Memorial and museum, Havana’s tallest building. There were events taking place outside at the time, by school children from local Havana schools – following street processions. The final resign place of Che Guevara, where the revolution was won in 1958. This will be a very significant year for Cuba as we see the ushering in of a new president – and an end to the long Castro reign. With relationships tense with the US and various political persuasions from Cubans about what the future of Cuba should be, I’m very curious to follow this as things evolve.